The growth in the Educate Together school network continues to be driven by parental demand and we support the rights of families to access the education they want for their children. Educate Together is enthusiastic to assist the Government’s objective to provide 400 ‘non-denominational / multi-denominational schools’ by 2030. 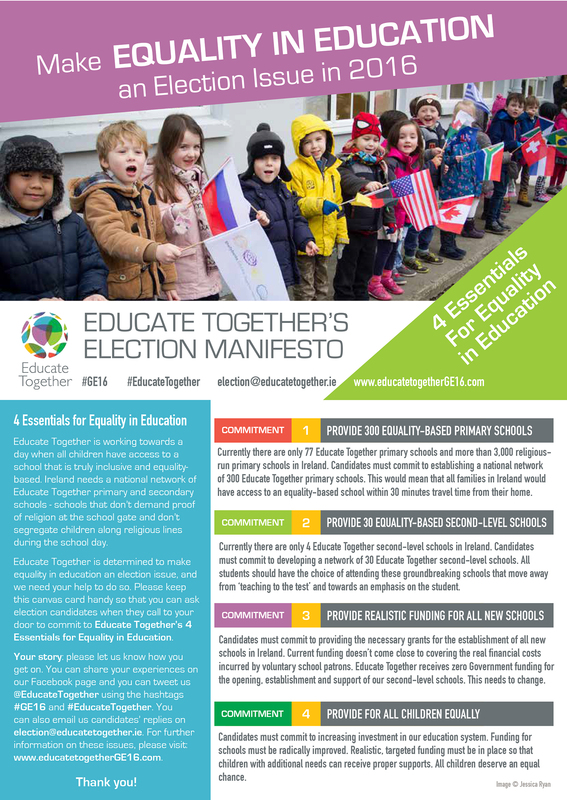 Educate Together has provided a plan – a national network of equality-based primary and second-level schools. Properly resourced by the State, such a network would enable the vindication of the rights of parents and children and also maintain the right of parents to choose religious-run schools if that is their preference. It would allow the State to demonstrate that is has lived up to its constitutional and international obligations and met the standards expected in a modern democratic state. Educate Together’s colleagues in the Children’s Rights Alliance report each year on the Government’s progress in providing new schools for families in their Annual Report Card – available to view here and download below.